Construction of safe, reliable and fun tree houses depends greatly on the planning, design and layout of the tree house construction site. On this page Tree Top Builders shows you how to effectively plan for tree house construction, how to design your tree house site and how to layout (measure or “map”) the trees that you plan to use to support your tree house. Once you have selected a potential site for your tree house, it is time to gather some initial information to assist with tree house design. Since there are only a handful of experienced tree house builders around, you may need to pay a significant fee to have a site visit to select a site, depending on your distance from us. If you want to build the tree house yourself, or you want to get a ballpark cost from us without paying travel costs, then it will help us if you go through the steps on this page and send us the information. It may be prudent to have the trees checked out by an arborist, especially if you have any doubts about their health or structural integrity. To hire a local consulting arborist, you should expect a fee of about $250. It may be higher for multiple trees, and if tree work is needed, you should expect much higher costs. It is better to spend this amount prior to designing and laying out the tree house to make sure that you have the best information about the trees you are going to build your tree house in. Make sure that your consulting arborist will be giving you a written tree analysis, and make sure you send this tree analysis to us so that we have the information too before we tell you what we can build in the tree(s). Take these measurements between the closest points of the trees, or inside to inside. Ideally, you take these measurements from the height where the tree house will be built. If not possible, get as close as you can safely. 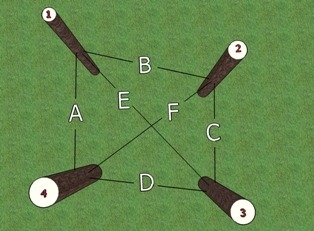 For tree houses with 3 trees, you will need 3 measurements. For tree houses with 4 trees, like the example above, you will need 6 measurements for the lengths of A, B, C, D, and the diagonals E and F.
After receiving your measurements, we can start to structurally design your tree house. Here is the continued example from above. The pictures will show us the approximate lean of each trunk and branch location. 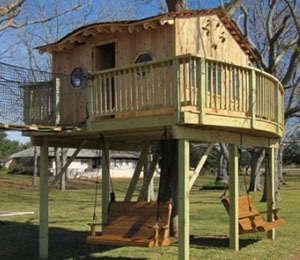 That will help us to design the tree house within the natural structure of your trees. The pictures need not be sent in high resolution. Take pictures from different angles and put something into the photo for scale if possible (lean a 6′ stepladder against one tree). Should I Pay for a Tree House Site Visit Anyway? Maybe. In the case of complex tree houses or when there are several locations to choose from, it makes more sense to hire us to visit your site. Alternatively, you may consider attending one of our tree house classes – where we cover the general tree house building process. Tree Top Builders can quickly layout each tree house site and help you envision each one so that you can decide based upon greater knowledge. However, if the tree house is simple, such as a tree house with only one tree, and you are far away, then it is probably not necessary to have us visit the site first – it will be cheaper and just as good for you to hire a local arborist rather than paying us for an initial site visit. Whatever your decision; proper layout, design and planning will greatly improve your chances for a long-lasting, safe and enjoyable tree house. If you’re not sure about any of these details, please contact us or call us to discuss your particular tree house situation.